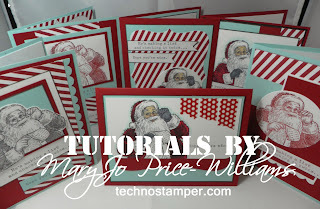 Techno Stamper: Santa's List Tutorial! I have been crazy sick but feeling much better today! So happy since I have been needing to finish this tutorial for a week now. I am thrilled with this one. So sweet. Since I do not send many non-Christian Christmas Cards these will be perfect for the few that I need. I used the same paper pack as the Prince of Piece Tutorial from a few weeks ago so you can get all twelve cards from the same paper pack--and much more of course. Six Cards all using the one stamp set. All cards are mailable and easily reproduced. All new layouts that can be used again and again. All cut sizes and step by step directions for each card. And all for ONLY $2.50!